Girls on the Move Week - « Elles Bougent » spreads the word across the globe in Dakar ! 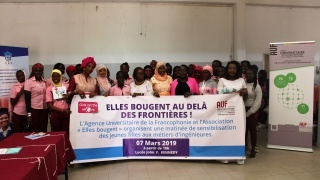 « Elles Bougent » spreads the word across the globe in Dakar ! On March 7, female engineers and teachers of science from universities in Dakar, Senegal, have raised awareness to 300 young girls about scientific careers, in JFK’s Highschool in Dakar, Senegal, in partnership with Francophone University Agency. The programme for the day included scientific popularization initiations and conferences for students led by female engineers and teachers of science from universities.